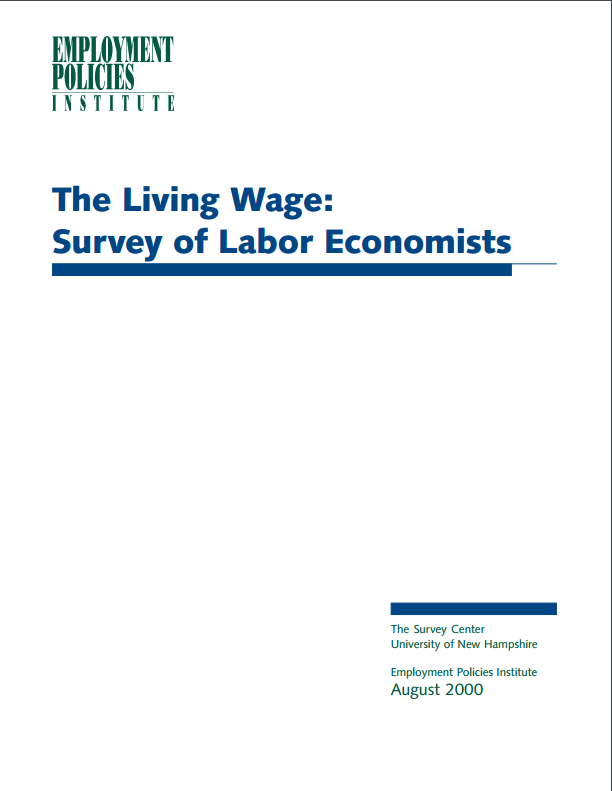 The 2000 Living Wage Survey was conducted by the University of New Hampshire Survey Center for the Employment Policies Institute in February and March, 2000. Three hundred thirty-six (336) labor economists in the United States completed mail questionnaires for the survey. A list of economists was obtained from the American Economic Association (AEA) and consisted of all AEA members who indicated that their primary or secondary area of expertise is labor economics. More than three-fourths of labor economists believe a national living wage would result in employers hiring better skilled applicants than they hired before the increase. Similarly, more than three-fourths of labor economists believe that a national living wage policy would result in employment losses. On a local level, the higher the proposed level of the living wage (in terms of its percentage of the current minimum wage level) the more likely employers are to hire better-skilled applicants. Also, the higher the proposed level of the living wage (in terms of its percentage of the current minimum wage level) the more likely employment losses will result. More than eight in ten labor economists strongly oppose using a family of four as the standard for setting hourly minimum wage levels. Economists are also strongly opposed to using a family of three as the standard for setting minimum wage levels. Labor economists were asked to rate the efficiency of three proposed policies which address the income needs of poor families: a living wage ordinance, the Earned Income Tax Credit, and general welfare grants. Of these three options, the Earned Income Tax Credit is rated most efficient followed by general welfare grants. A living wage ordinance is judged least efficient. More than half of labor economists (51%) rated the Earned Income Tax Credit as very efficient, another 47% believe it is somewhat efficient, and only 2% think it is not at all efficient. General welfare grants are rated very efficient by 15% of labor economists, 66% believe they are somewhat efficient, and 19% think they are not at all efficient. Only 7% of labor economists believe a living wage ordinance is a very efficient way to address the income needs of poor families, 24% think it is somewhat efficient, and 69% think it is not at all efficient. Labor economists are divided over the impact of a national living wage policy on poverty rates with a plurality (43%) believing that such a policy would lead to increased poverty rates, 31% believe such a policy would lead to reduced poverty rates, and 26% believe such a policy would not result in a change in poverty rates.